If you are tired of the same old, same old dinner salad...now is the time to add some flavorful heat and kick it up a notch with some flavorful peppers. You can toss in fresh peppers, sprinkle on hot sauces or spice it up a bit with some flavorful croutons. Here are some of our favorite ways to add some spicy kick to our dinner salads. * To add some heat and much added flavor to your favorite salad dressings, try adding a few drops of your favorite hot sauce or pepper extract to your dressing. Measure out an 1/8 cup of the dressing and then add in your additional ingredients. Pour dressing immediately over your vegetable salad. * You can add all kinds of fresh peppers to your salad! 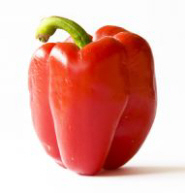 When people think of adding peppers to their favorite greens they often think of just adding the red or green bell pepper. However, you can add jalapenos, chili peppers, banana peppers, cherry peppers or sweet cubanelle peppers all make great additions and are nutritious too! * If you like a little crunch consider adding some spicy homemade or store bought croutons to your favorite salad. You can find croutons in the store that come in a wide variety of flavors, including spicy ones like cracked black pepper to add some heat! * Got leftover spicy chicken from the night before? Chop it up and toss it in your salad! You can use breaded chicken, skinless chicken or chop up some leftover hot wings and toss them in!